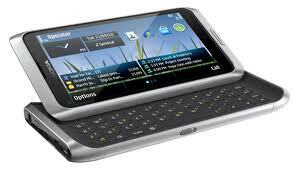 Nokia E7 is a smartphone with qwerty keypad, Active Matrix OLEDs (AMOLED) touchscreen. 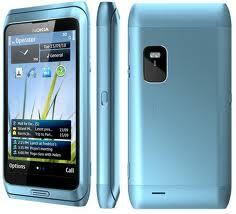 It has 8 mega pixel camera with dual LED flash, face detection, video stabilization and geo-tagging. The battery has 480 hours standby power and 5 hours talk-time power. While looking at memory storage it has a internal memory of 16 GB, 256 MB RAM, 1 GB ROM. And other features are that it has bluetooth, SMS, MMS, Email, push email, IM, GPS, GPRS, EDGE, Symbian 3 OS, ARM 11 680 MHz processor, 3d graphics hardware accelerator, Wi-Fi, micro USB v2.0 and USB on-the-go support where the device themselves become the host when connected with another USB device, 3G features include High Speed Downlink Packet Access 10.2 Mbps, High Speed Uplink Access 2 Mbps, MP3/WAV/WMA and MP4/WMV, call recordings upto 30 days, FM, Games, voice command, editors for documents, photos and videos, can be connected to tv through HDMI and other supporting ports, Browsers like RSS reader, HTML, WAP 2.0/xHTML. The phone comes in five colors like orange, green, blue, silver and dark grey.